Another photo from the Joint Service Open House at Joint Base Andrews a couple weeks ago. The B-2 Spirit bomber “Spirit of Nebraska” made several passes at the airshow. 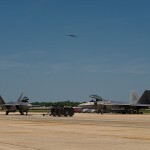 In this photo, the B-2 appears to be headed over an F-22 Raptor that had just returned from its own aerial demonstration. Before arriving at Andrews, the B-2 flew over Pimlico Race Course in Baltimore, Maryland in the opening festivities of the 137th Preakness States and, according to airshow announcer Rob Reider, was going to fly over several other events before returning to its home in Missouri at Whiteman Air Force Base.